Honor graduates with a stunning and beautifully designed diploma to formally recognize their years of hard work in school. Being able to graduate is no easy task, and this special achievement warrants praise that shows appreciation for the student's effort. Choose from our wide variety of premium diploma templates and create one for your academic institution. These files are easy to use, free to download and fully customizable. Make use of the creative and high-quality layout, artwork, images, and graphic files. They are also printable and can be shared digitally through email and other online platforms. Easily Editable and can be opened in all versions of Adobe Photoshop (psd), Illustrator (.ai), Indesign, Microsoft Word (.doc), Excel (.xls), Publisher, Apple Pages, Mac & Google Docs. 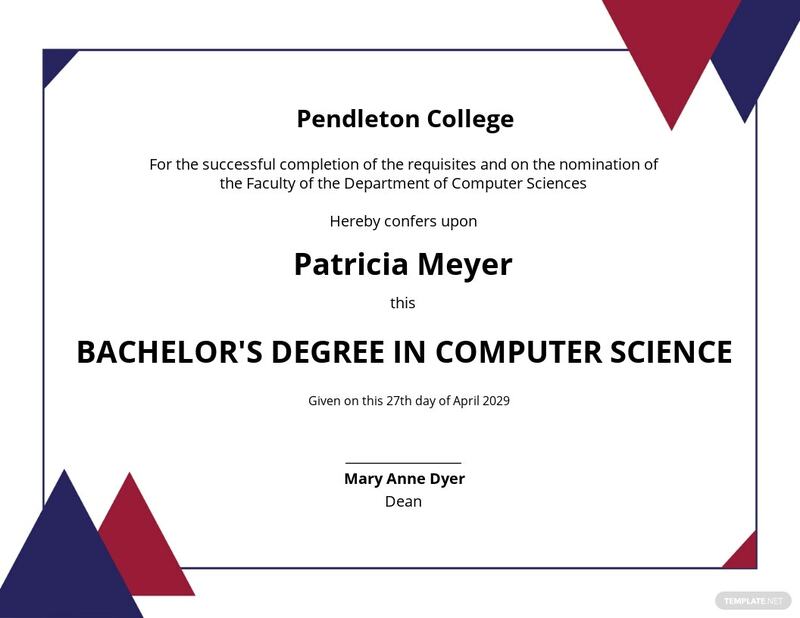 Diploma certificates are issued by educational institutions to serve as proof that the recipient has successfully completed a particular course or study. These days, a lot of people actually go back to high school or university to get a diploma certificate to enhance their existing bachelor’s degrees. Diploma courses are offered to specifically tailor a person’s level of knowledge and build on a person’s skills. Diploma certificates are a great option for anybody looking to extend their knowledge and skills in certain areas. 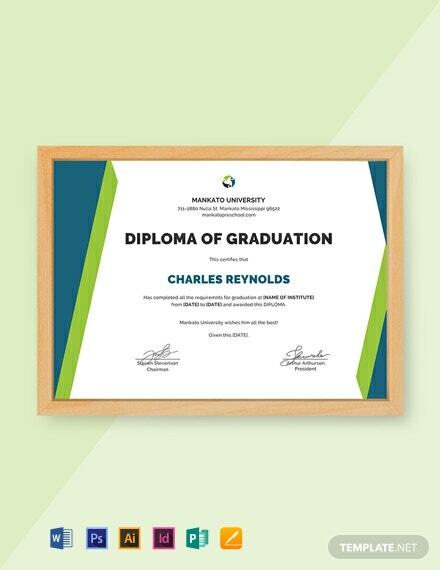 Graduate diplomas award individuals by providing them with ways to expand or deepen their knowledge, and thus help increase their professional qualifications in the long run. If you are looking to gain specialized skill sets, getting a diploma degree and certificate can certainly give you a leg up in your career. 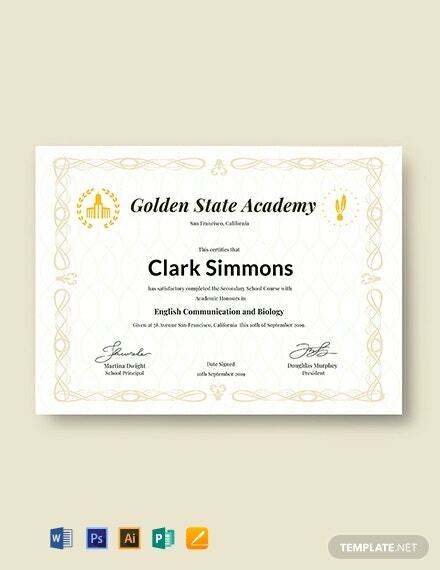 Certificates are cost effective and easy to make. 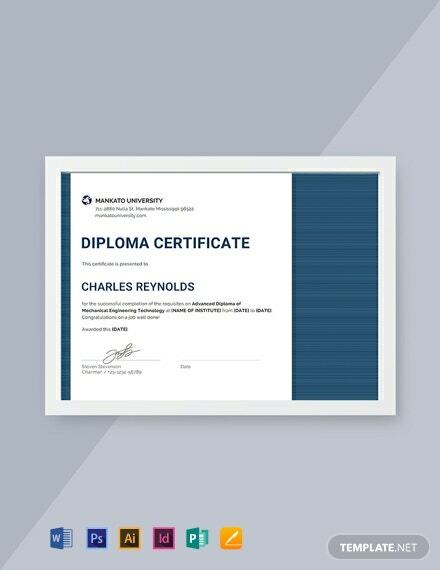 Diploma certificates in particular can boost a person’s professional status and thus lead more employers to consider those with diploma certificates for employment or for promotion. Diploma certificates are creative and are usually unique to each institution, although the elements included in them are the same. 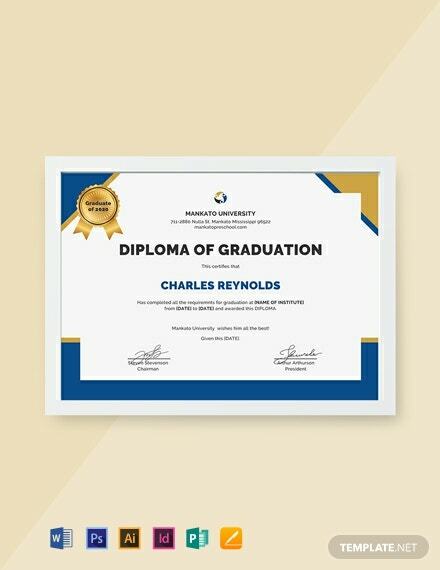 Certificates of achievement typically include an emblem or logo of the institution, the name of the recipient, an indication of the awarded diploma, and a signature of an official from the institution. 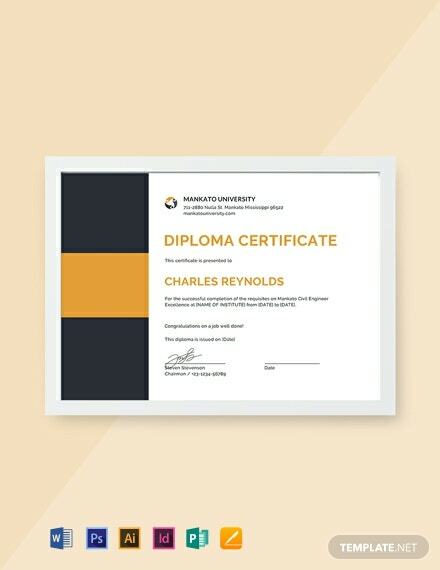 However, diploma certificates in premium designs stand out from the rest, and thanks to our team of professional designers, Template.net can guarantee only the best. Thanks to a wide variety of ready made certificates available on this website, you will never have to make a diploma certificate from scratch for your school’s graduation ever again. 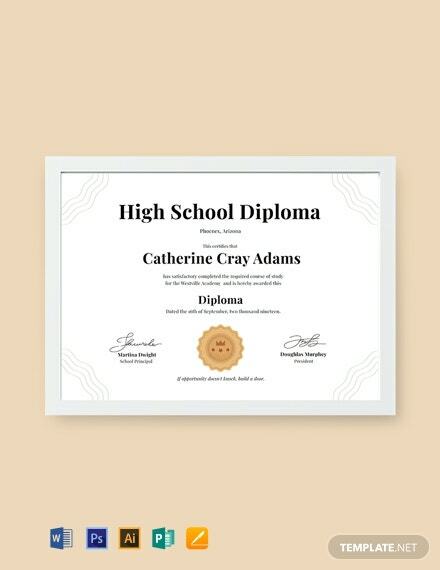 Template.net offers a multitude of diploma certificate template for you to choose from in varying editable designs, and made available in multiple file formats for your convenience. With files in Microsoft Word, Apple Pages, and Adobe Photoshop to start with, you know that these downloadable files are sure to be compatible with your computer’s Operating System. 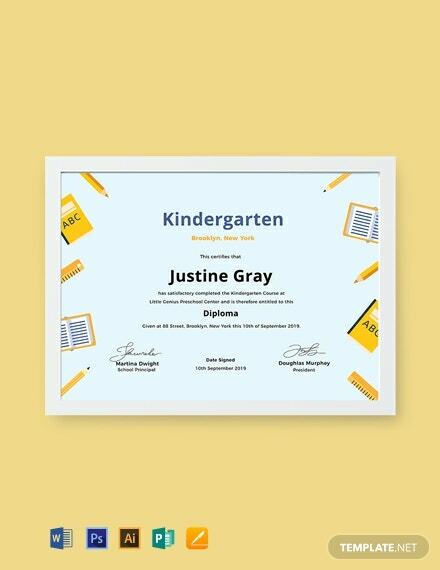 Not only that, each of these templates come in guaranteed fully customizable, high-quality images and graphics that are printable in stunning 300 DPI resolution to impress your students and trainees, and encourage them to keep their beautiful diploma certificates with pride. Visit Template.net and feel free to search out extensive library of examples and templates for the perfect diploma certificate template for your institution, now.